EFT (Emotional Freedom Technique) / Tapping (Meridian Tapping Therapy MTT) is a proven technique (one of the meridian tapping techniques) to free yourself from unwanted experiences, memories, mental and emotional blocks and patterns and to get back in control of your emotions, your thoughts and your life. EFT is also a tool to tap into any areas of your life and improve it, e.g. health, finances, learning and success by neutralising any blocks to success. EFT allows to experience an immediate shift in your energy and the results. It gets you back into the ‘zone’, restoring your confidence, balance and focus. Do you want to have more control in your life? Learn EFT/tapping now. Tapping is an energetic ‘acupuncture’ without needles. You use your fingers to gently tap on the energy meridian points which sends signals to the amygdala, the fight-or-flight part of the brain, to relax you and bring balance to your body and mind. EFT/tapping is the best hands-on tool for neutralizing or erasing any negative feelings and emotions as well as most problems that have an underlying emotional cause. Call/text/Whatsapp Jan now on 07956 288574 or email him to find out how EFT can help you. 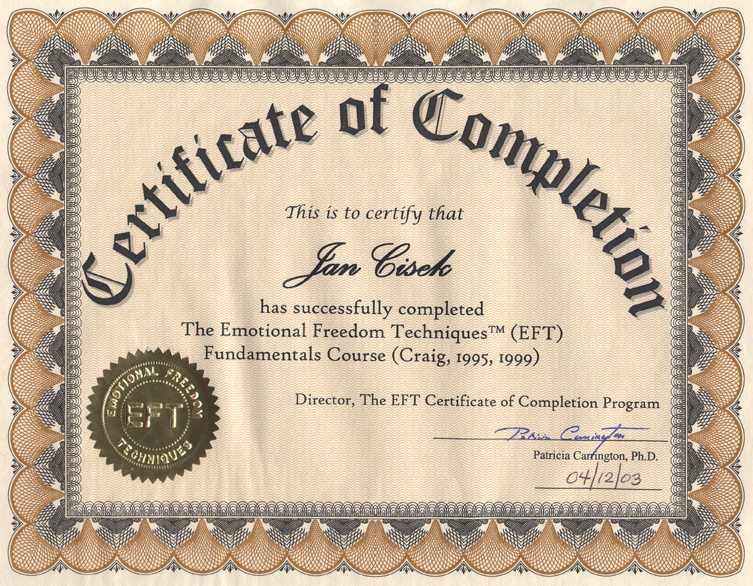 Jan Cisek studied EFT with Gary Craig, the developer of EFT and has a diploma in EFT from Patricia Carrington. Jan applies EFT in a variety of contexts from personal to business. He practises EFT/tapping in Central London (South Kensington, SW7). Jan is also an NLP Master Practitioner (Neuro-Linguistic Programming), Environmental Psychologist (MSc) and Spiritual Health Mentor. Jan has been practising and teaching EFT worldwide since 2003. He believes that tapping is the best tool for self-empowerment, stress management, personal transformation and manifestation of goals by removing any emotional and mental blocks and sabotaging patterns. I offer telephone / Skype / remote EFT/ tapping sessions as well. Call/text Jan now on 07956 288574 or email him to find out how EFT can help you. What is EFT (Emotional Freedom Technique) or tapping? By neutralising the emotional charge behind the past patterns, you can free yourself from unwanted symptoms of those patterns or habits. The concept that your emotions impact your health and the development of the disease is not new. Even the conservative Centers for Disease Control and Prevention (CDC) has stated that 85% of all diseases have an emotional aspect, but that the actual percentage is likely to be even higher. Research that spans across the last three decades has produced scientific proof indicating that your current health status is due to your mental and emotional reactions to events that take place during your lifetime (Dr Hamer, Bruce Lipton). Energy psychology states that if somebody is sick today, it’s because they didn’t finish something yesterday. And that yesterday could be yesterday, it could be 50 years ago, it could be at the birth or it could be ancestorial. EFT helps to clear the past so we can be free, happy and healthy today and in the future. Emotional Freedom Technique (EFT) is an energy psychology tool that works on several levels of your collective mind-body-spirit simultaneously to help you get a better handle on your emotions, buried pain or traumas, including the stress from unexpected tragedies. Optimal health stems from dealing with and resolving your emotional traumas as quickly as possible and not letting old emotional wounds linger and fester. EFT is based on similar principles to acupuncture but uses no needles. It is pain-free and leaves you feeling much better. During EFT/tapping session you will tap with your fingers on acupuncture points to erase unwanted feelings, thoughts or stress. Tapping is the easiest and most practical technique available now to help you with most problems. The key principle behind EFT is that most of your problems (emotional, physical, mental, and even financial) are caused by imbalances and blocks in your energy system. The skill you’ll learn during the session can be used anytime, anywhere – for life. We guarantee you’ll love it. EFT has been popularised by Paul McKenna’s regular use of this method on TV. Many hypnotherapists, NLP practitioners are now using EFT in favour of their standard treatment, as it can give immediate results. Thousands of people worldwide are using EFT, and it has become the fastest-growing self-help and personal development tool because it’s so easy to learn and use. Many athletes are now using EFT for sports enhancement. EFT is popular among golfers because it gives them a competitive edge. EFT was developed by Gary Craig, a US Stanford engineer who became interested in Roger Callahan’s work (the originator of TFT – Thought Field Therapy) which is a system involving individualised sets of acupuncture points which you tap to resolve specific emotional problems. EFT has been greatly simplified by reducing the system down to a small number of acupuncture points which are tapped to neutralise all possible problems. • Are you afraid of repeating past mistakes? • Have you heard about the Law of Least Effort? • Visualization can lead to effortless success. • How to turn around self-sabotage. • Living the Law of Attraction. • Meridian tapping is the key technique to clear any blocks to success. Multigenerational trauma is a hidden and destructive phenomenon. The transmission of devastations experienced by parents, grandparents and ancestors leaves – almost universally – a deeply woven, invisible injury in the minds, bodies and auras of the living, operating within the psyche as an unseen but potent force, often manifesting as a psychological fixity that leads to vulnerability throughout life. Multigenerational transmission of trauma is an integral part of human history, hidden, and often shrouded in shame and silence, transmitted in a word, writing, body language and even in silence. How can we intervene psychotherapeutically and socially to break the cycles of parent-to-child trauma and maximise healing for the future? With EFT healing of the intergenerationally traumatised individual is possible. EFT can effectively neutralise any traumas, old or new. For tapping / EFT sessions in South Kensington, London – call/text/Whatsapp Jan now on 07956 288574 or email him to find out how EFT can help you.